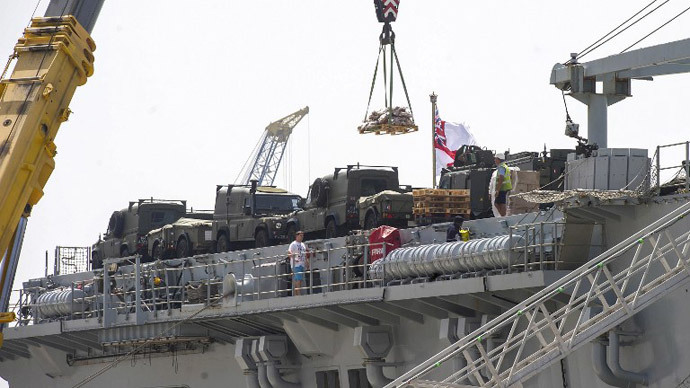 The UK military is preparing to offer one of Britain’s biggest warships to tackle the refugee crisis in the Mediterranean Sea, which has left thousands of migrants dead. HMS Bulwark, a warship with a 176-meter launch pad for helicopters and small vessels, could be among the main options offered by British officials as they try to find a response to the crisis, in which up to 1,300 migrants drowned last week alone. The Bulwark would be primarily sent to target people traffickers in Libya. “We are scoping [options] to see what might be required,” a Whitehall source told the Times. “The prime minister will want to go out to the summit armed with a range of things that we might do,” he said, referring to the European leaders emergency meeting held on Thursday in Brussels. Other possibilities include sending naval helicopters to surveil shorelines or diverting HMS Dauntless, a Type-45 destroyer, which is about to return to the UK after a five-month deployment in the Gulf. A YouGov poll for the Times analyzed voters’ reactions to possible UK backing for search and rescue missions for refugees in the Mediterranean. Overall, more voters supported the idea of the EU funding search-and-rescue operations (44 percent) than opposed it (34 percent). However, last October Britain ended its support for the search and rescue operation Mare Nostrum. Only now is the pressure mounting on European leaders to find a solution, as more migrants are dying in the Med. Mayor of London Boris Johnson said Britain should deploy Special Air Service (SAS) to North Africa to tackle the migrant crisis. “I'm a long way away from the discussions about this but there are clearly some very highly organized and ruthless people who are sending people to their deaths in the Mediterranean,” he said at an interview with LBC Radio on Wednesday. “We've got to make sure, yes, there is an element of search and rescue, but that can only be one part of this and we should use all the resources we have, including our aid budget which can play a role in trying to stabilize countries and trying to stop people from traveling,” Johnson added. Meanwhile, in frank and stark words, opposition leader Ed Miliband criticized the UK government for “leaving people to drown” in the Mediterranean Sea. “I think we can’t just leave people to drown in the way that is happening and the original decision was a mistake and it should be reversed,” said Miliband. He called the government’s decision to end the search and rescue mission a mistake and called for a reinstatement. “Frankly I think it is a stain on Europe to have these things happening on our shores and in our waters and so, what I would be saying at the European Council tomorrow is that we’ve got to act, we’ve got to act on search and rescue, and that is about basic humanity and I think that people all around the country will recognize this,” Miliband told an audience at a Labour event in Manchester. He said although the first responsibility for the deaths of migrants lay with traffickers, it was now Europe’s responsibility to save lives where it could.